Zeus is a 2 year old Lab/Shepherd mix with just enough Husky for good luck. Truth is when we met Zeus and heard his sad story, we knew we wanted to help him. Zeus was originally brought home for a 6 year old child. The novelty wore off and no attempts were made to train him to be a well behaved, loving companion. Instead Zeus was placed in a crate in the basement. With neglect and boredom, he learned to open his crate. He was then chained to a treadmill and remained in the basement like a forgotten toy. Finally, they took him to a local shelter. Poor Zeus went from a dark lonely basement to a bright and crowded shelter, overwhelmingly noisy from other homeless dogs. He did not do well in this drastic change of environment. Zeus was confused and very frightened, so much so that his chances of adoption were slim. The shelter contacted us knowing Zeus needed some help in becoming the happy dog he should have been. With a little time and lots of TLC, Zeus is learning to trust people and he is having a ball with the other dogs. He still frightens easily when he first meets strangers, but his confidence grows daily. He is a very affectionate guy who is eager to please. 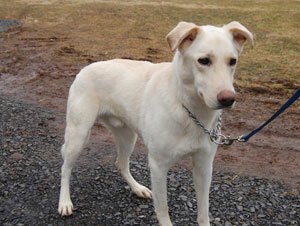 Zeus will best be placed in a home that will dedicate time and effort to continue with his basic training. He has a lot of puppy in him and he is ready to make up for lost time. If you have room in your heart and are ready to help this guy with a second leash on life, you will receive in return a lifelong companion that just wants to belong and be loved.